Do you love your Boss CS-3? Then you need to go for this mod and you will not understand why you loved it before. 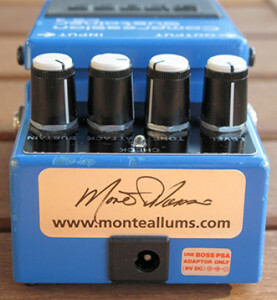 Here is a modification to the Boss CS-3 that I purchased from Monte Allums. I just couldn’t believe how great the sound after I applied the mod! I can just highly recommend this to any Boss CS-3 owner. Gather up all the coins in your wallet, order the parts with the easy to understand instructions from Monte Allum and get your screwdrivers and soldering tool out. You’ll be awarded with this: noise decreased even at high compressed levels and a very clean signal coming out of your stomp box! Just one thing I wouldn’t do: don’t use the ‘Super Bright White LED’, you’ll burn your eyes out. Leave it with the original red LED unless of course you wear sunglasses on stage at all time. All in all it took me about 2 hours to finish this mod. You can find more information about the mod-kit here: https://www.monteallums.com/pedal_mods_CS3.html#optoplus. I can also highly recommend all the other Monte Allums mods! P.S. let me know if I should do the mod for you. Contact me using this contact form below. You will need to send your CS-3 with or without the Monte Allums parts to Germany or Switzerland.